Google has unveiled a new algorithm for its search engine functionality called the Hummingbird. Unlike other algorithm updates, it is actually possible for you to get your SEO improved with the help of Google Hummingbird. 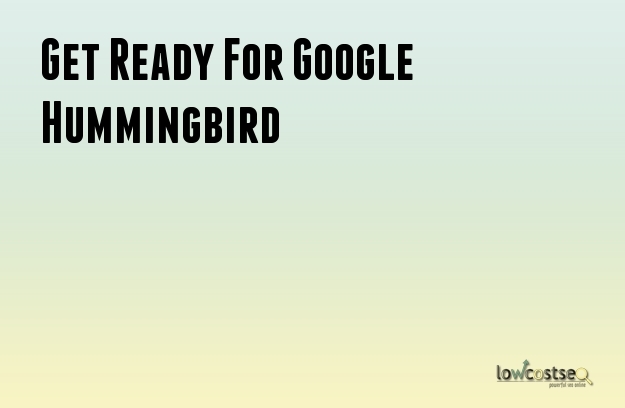 The Hummingbird update is the result of efforts by Google to make their search engine seem more human. Google is decreasing the reliance and important given to keywords. Instead, the Hummingbird algorithm will try to understand the intent of the user for the search term. This in turn helps Google to provide helpful and relevant results. Hummingbird is meant for processing conversational queries. It affects around 90% of search quires as well. It is however different from the other updates and algorithms by Google. Hummingbird is different from Google Penguin as it does not serve to penalize websites. Rather, it rewards websites that provide a suitable answer to the queries of the user. It is also different from Google Caffeine as it does not cater to indexing of websites. Instead, Hummingbird helps the search engine to interpret the search queries in a better fashion. Due to the major changes brought around by Hummingbird, you will need to implement some modifications of your own to your SEO. You will need to stop giving too much attention to keywords. Instead, you have to analyze and understand the actual intent of the search queries. Hummingbird takes the conversational queries which tend to be longer and then distil them to understand what the intent behind the search is. You should utilize keywords that can accurately convey the meaning of the longer search queries. Pages for the different types of queries such as transactional and navigational should be created. Implement conversational keywords wherever appropriate such as headings. The keywords are not the only terms considered by Google Hummingbird. It also takes into account their synonyms. Optimize your content with keywords whose synonyms often occur in a similar context. You can check Google Webmaster Tools for gaining ideas about additional keywords and possible synonyms. It is also possible to check the words considered by Google to be synonymous to the search term through the highlighted terms in the search results. Hummingbird pays attention to websites that are getting mentioned alongside more popular competitors. Try to get your website listed on lists related to your niche such as top 10 lists. Analyze the websites where your competition websites are getting citations. Contact those webmasters to see if you can get cited as well. Perform an analysis on the backlinks of the competitor websites to locate other sources for citation. Anchor texts are still considered by Google Hummingbird. Create an inventory of all the anchor text being used for internal linking. Avoid using anchor text rich in keywords. Instead, they should be meaningful. The anchor text can be surrounded by the relevant keywords. Google Hummingbird is major change in the search engine. You need to modify your website in the appropriate manner in order to make the most of it.